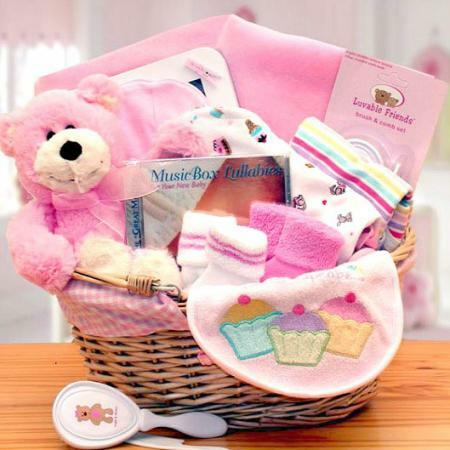 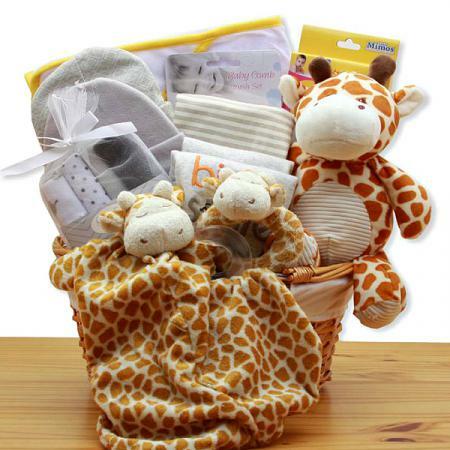 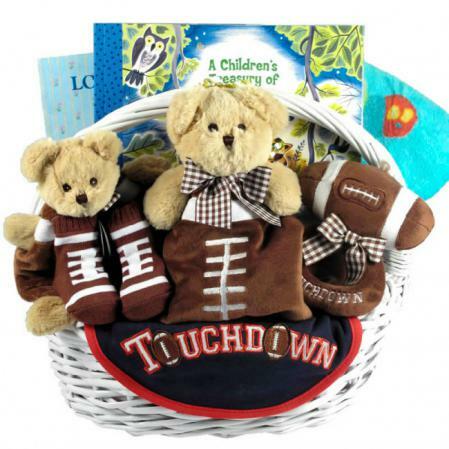 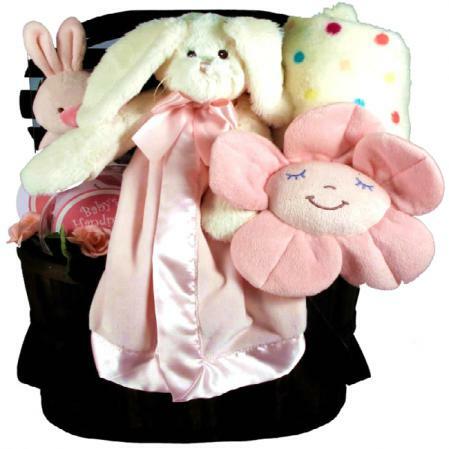 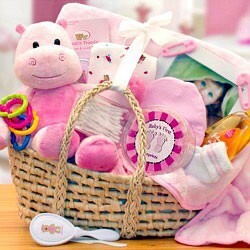 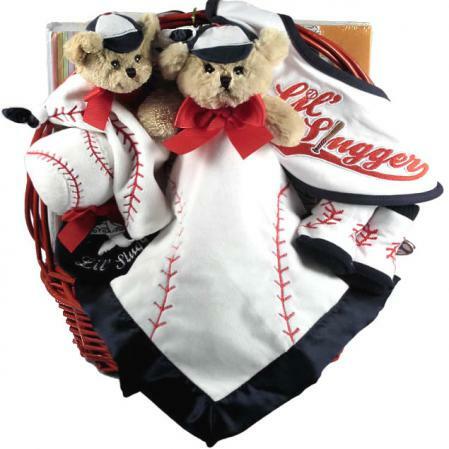 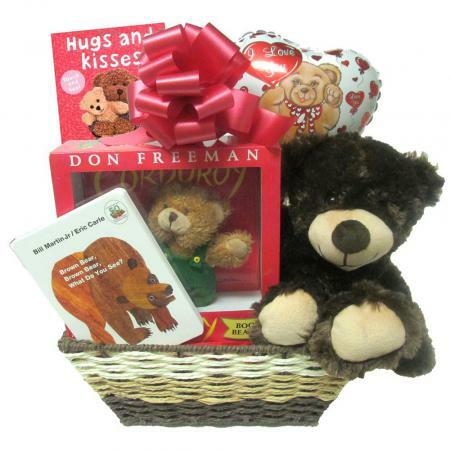 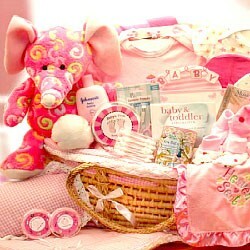 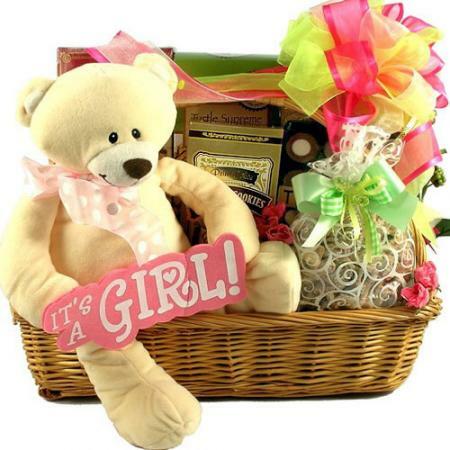 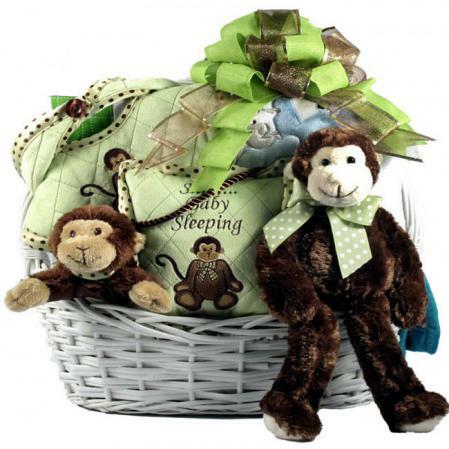 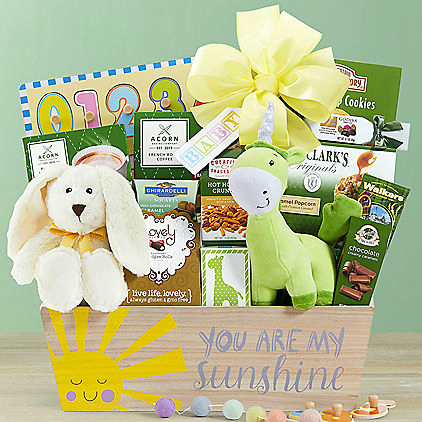 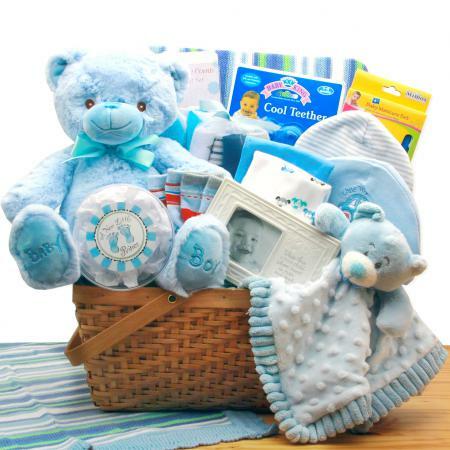 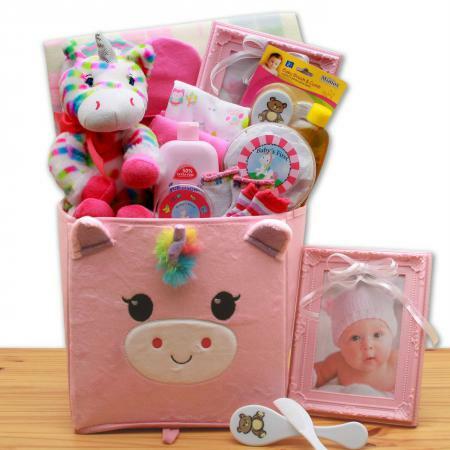 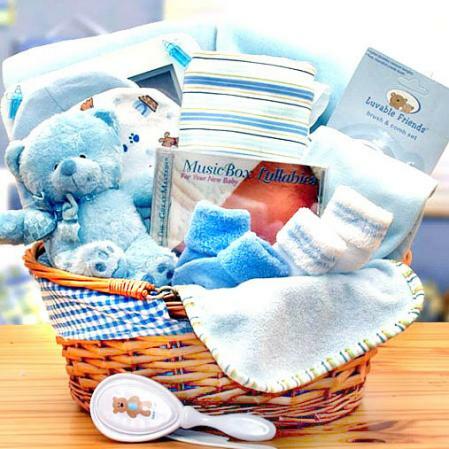 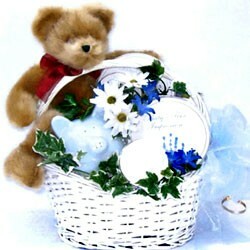 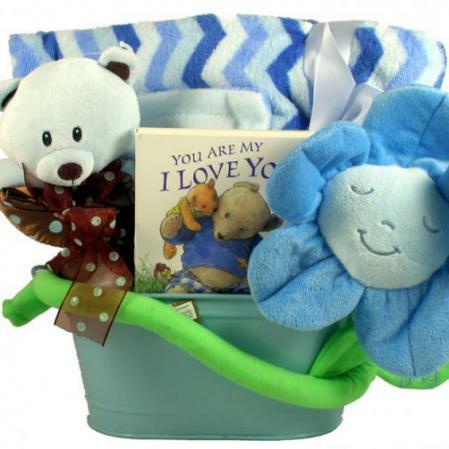 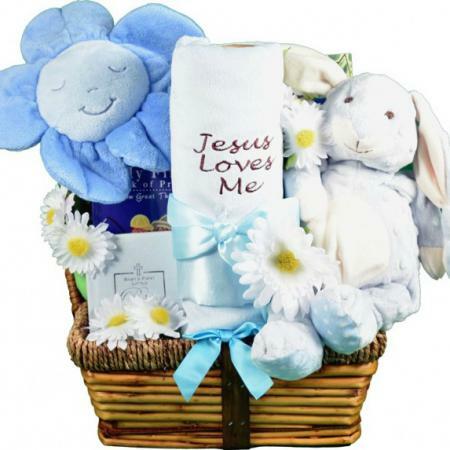 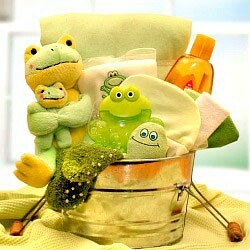 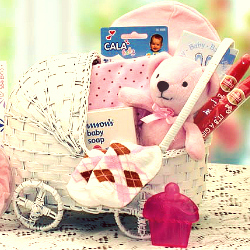 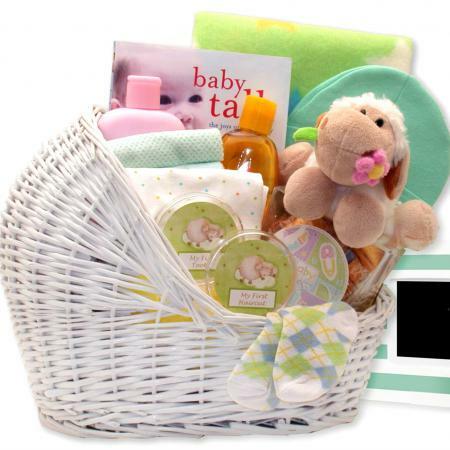 You won't find anything cuter than this adorable new baby gift basket filled with keepsakes and adorable baby gifts. 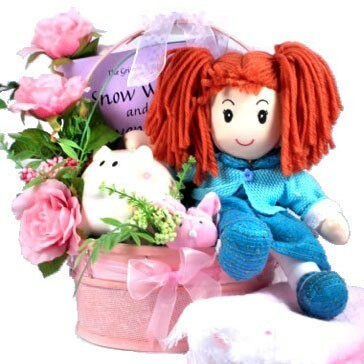 Available in blue or pink. 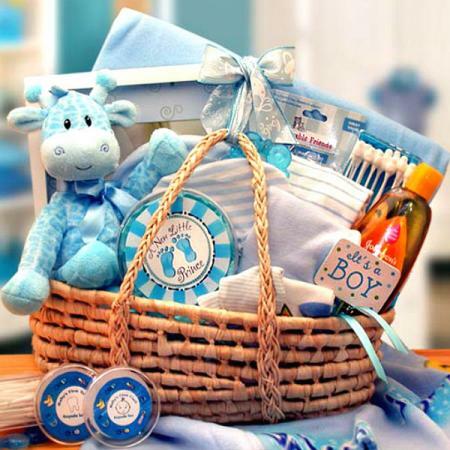 You just can't find anything cuter than this adorable for the new baby boy or girl. 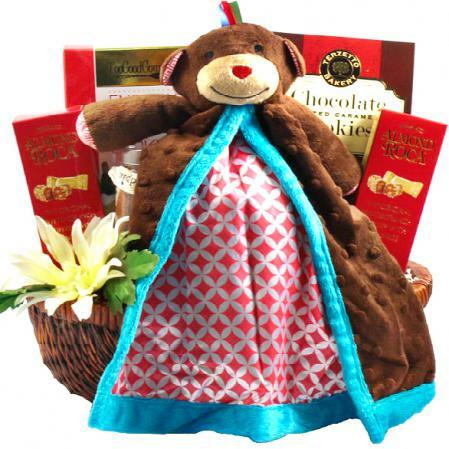 We've also included some delicious treats for mom and dad. 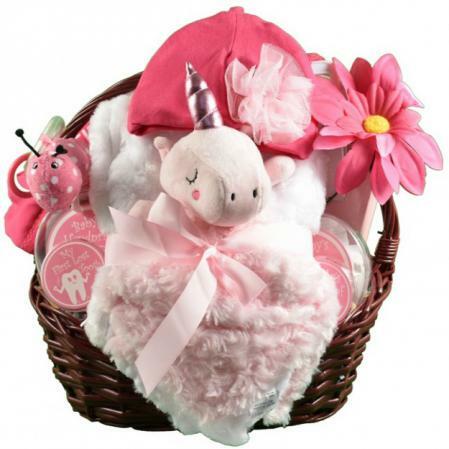 Select pink or blue at checkout. 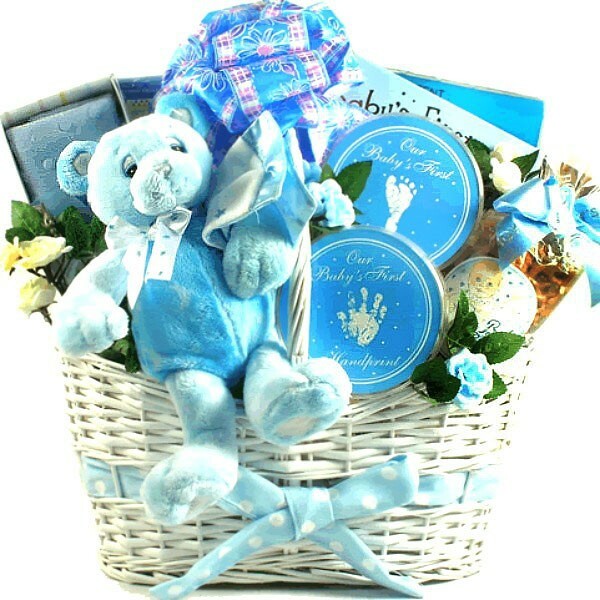 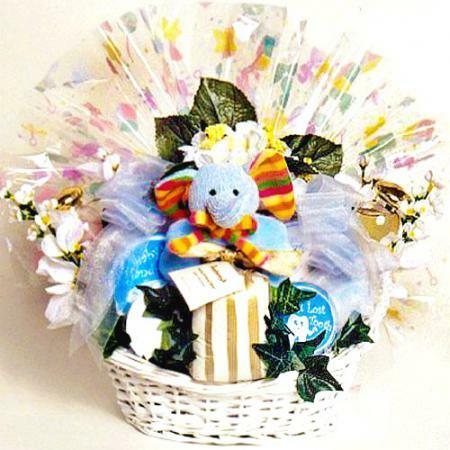 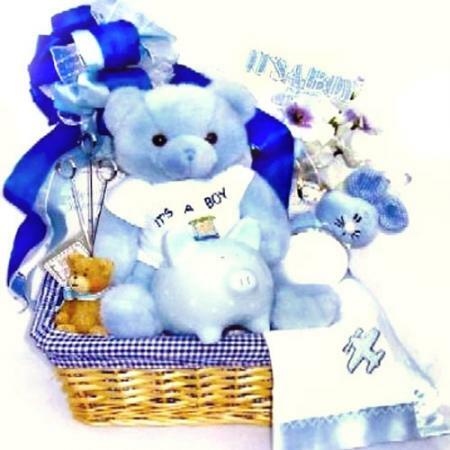 The big beautiful gift basket (shown here in blue) includes a very special painted basket (7"H X 9"W X 13 1/2"D) with ribbon woven through it filled with a soft blue bear named Twilight (Twinkles if you are selecting our girl option), holding his blankie and when his key is turned, “Brahms Lullaby” plays while he moves his head from side to side. 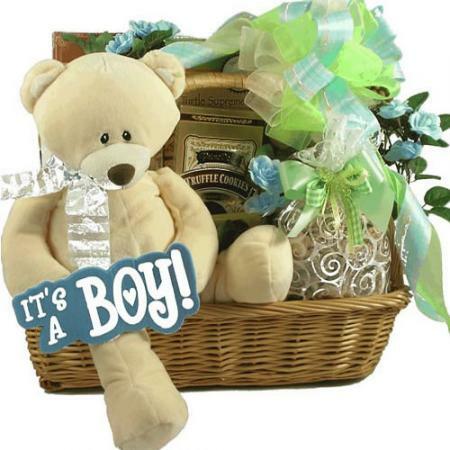 He is adorable! 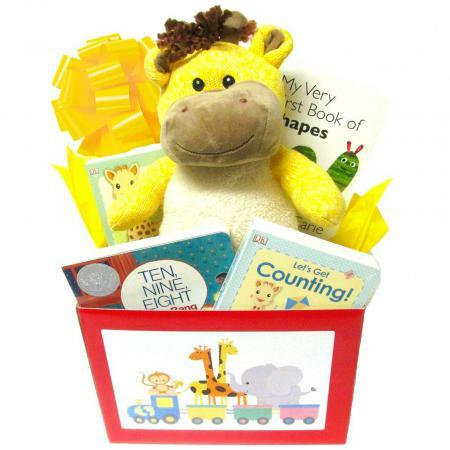 Also included is a baby blankie for the new baby, a “Our Baby’s First Handprint” molding kit, a “Our Baby’s First Footprint” molding kit, a “Baby’s First Lullabies” book with lullaby CD, Peach and Passion Fruit Tea, “Baby Bits” gourmet snack mix, Butter Wafer Cookies, Toasted Almond Cookie Straws, Shortbread “Thinking of You” Cookies, and a special Spa Set for Mom which includes, lotion, Body Butter, Shower Gel and a massager! 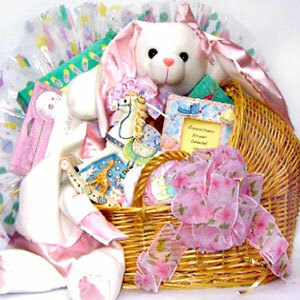 The much larger version of this basket (8"H X 11"W X 17"D) arrives filled with everything mentioned above plus, a ceramic piggy bank, a baby photo album, a baby bottle, a plush rattle, “First Tooth” and “First Cut and Curl” keepsake containers, Key Lime White Chocolate Cookies and assorted Chocolates! 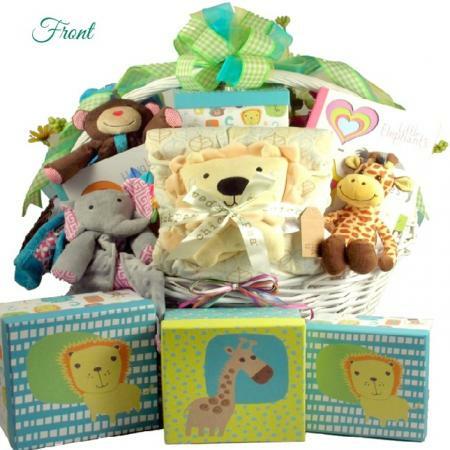 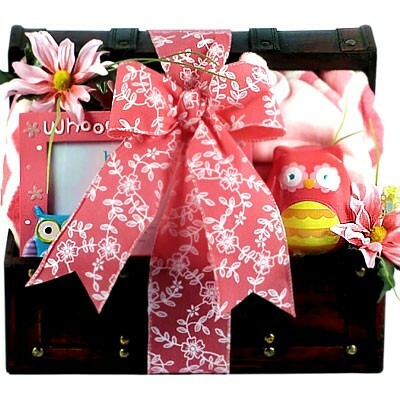 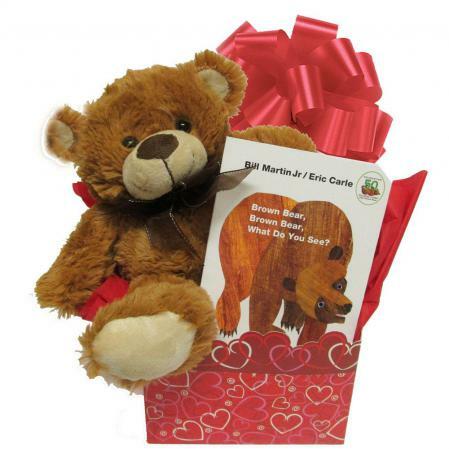 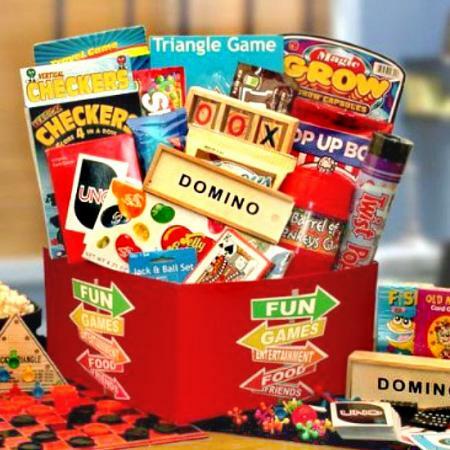 Click here to view more baby gift ideas.